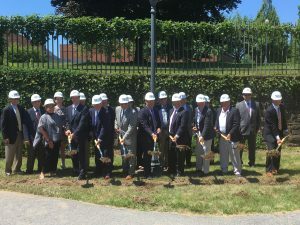 On July 9, 2018, Lycoming College and Wohlsen Construction celebrated the groundbreaking for the college’s new Krapf Gateway Building in Williamsport, PA. This 31,250-square-foot facility is expected to serve as the hub of student activity, housing admissions and alumni relations, the Center for Enhanced Academic Experiences, and the Outdoor Leadership and Education program. Designed by BHDP Architecture and Derck & Edson, the building will feature several presentation, seminar, and study rooms, as well as a café, and outdoor plaza. The focal point is its three-story atrium, which will feature lounge space with an indoor rock climbing wall. The building’s curved brick façade and two-story windows provide a striking first impression to campus visitors, students, staff, and the local community. “A truly distinctive entrance to the college – one that immediately signals that this is an institution of substance,” Lycoming College’s Chair of the Board, Stan Sloter, shares. In addition to serving as the focal point of the college, the Krapf Gateway Building is expected to spur development in Williamsport’s neighboring East End. Street reconfiguration in the area will allow pathways connecting the campus to the downtown area and to the Susquehanna River Walk. 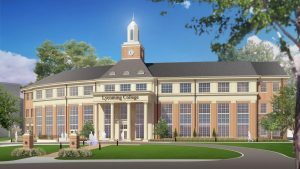 The project is slated for a Fall 2019 completion and is a key component of the Campaign for a Greater Lycoming, which aims to place the college among the nation’s top liberal arts institutions.